We started by analysing 4 different musical gestures for the guitar, which was skipped due to time constraints during the last session. During this analysis we found the need to specify the spread of the analysis results in addition to the region. This way we could differentiate the analysis results in terms of stability and conclusiveness. We decided to analyse the flute and vocal again to add the new parameters. The analyser was still run in Reaper, but all routing, effects chain and mapping (MIDIator) was now done in Live. Because of software instability (the old Reaper projects from November wouldn’t open) and change of DAW from Reaper to Live, meant that we had to set up and tune everything from scratch. 1. Guitar & Vocal – First duo test, not ideal, forgot to mute analyser. 2. Guitar & Vocal retake – Listened back on speakers after recording. Nice sounding. Promising. Reflection: There seems to be some elements missing, in a good way, meaning that there is space left for things to happen in the trio format. There is still need for fine-tuning of the relationship between guitar and vocal. This scenario stems from the mapping being done mainly with the trio format in mind. 3. Vocals & flute – Listened back on speakers after recording. Reflections: dynamic soundscape, quite diverse results, some of the same situations as with take 2, the sounds feel complementary to something else. Effect tuning: more subtle ring mod (good!) compared to last session, the filter on vocals is a bit too heavy-handed. Should we flip the vocal filter? This could prevent filtering and reverb taking place simultaneously. Concern: is the guitar/vocal relationship weaker compared to vocal/flute? Another idea comes up – should we look at connecting gates or bypasses in order to create dynamic transitions between dry and processed signals? Reflections: both the flute ring mod and git delay are a bit on the heavy side, not responsive enough. Interesting how the effect transformations affect material choices when improvising. It is interesting to be in a situation where you, as you play, are having multi-layered focuses- playing, listening, thinking of how you affect the processing of your fellow musicians and how your sound is affected and trying to make something worth listening to. Of course we are now in an “etyde- mode”, but still striving for the goal, great output! It seems to be a bug in the analyser tool when it comes to being consistent. Sometimes some parameters fall out. We experienced that it seems to be a good idea to run the analyse a couple of times for each sound to get the most precise result. We now have some tools that allow practical experimentation, and we’ve had the chance to use them in some sessions. We have some experience as to what they solve and don’t solve, how simple (or not) they are to use. We know that they are not completely stable on all platforms, there are some “snags” on initialization and/or termination that give different problems for different platforms. Still, in general, we have just enough to evaluate the design in terms of instrument building, software architechture, interfacing and control. We have identified two distinct modes of working crossadaptively: The Analyzer-Modulator workflow, and a Direct-Cross-Synthesis workflow. The Analyzer-Modulator method is comprised of extracting features, and arbitrarily mapping these features as modulators to any effect parameter. The Direct-Cross-Synthesis method is comprised by a much closer interaction directly on the two audio signals, for example as seen with the liveconvolver and or different forms of adaptive resonators. These two methods give very different ways of approaching the crossadaptive interplay, with the direct-cross-synthesis method being perceived as closer to the signal, and as such, in many ways closer to each other for the two performers. The Analyzer-Modulator approach allows arbitrary mappings, and this is both a strngth and a weakness. It is powerful by allowing any mapping, but it is harder to find mappings that are musically and performatively engaging. At least this can be true when a mapping is used without modification over a longer time span. As a further extension, an even more distanced manner of crossadaptive interplay was recently suggested by Lukas Ligeti (UC Irvine, following Brandtsegg’s presentation of our project there in January). Ligeti would like to investigate crossadaptive modulation on MIDI signals between performers. 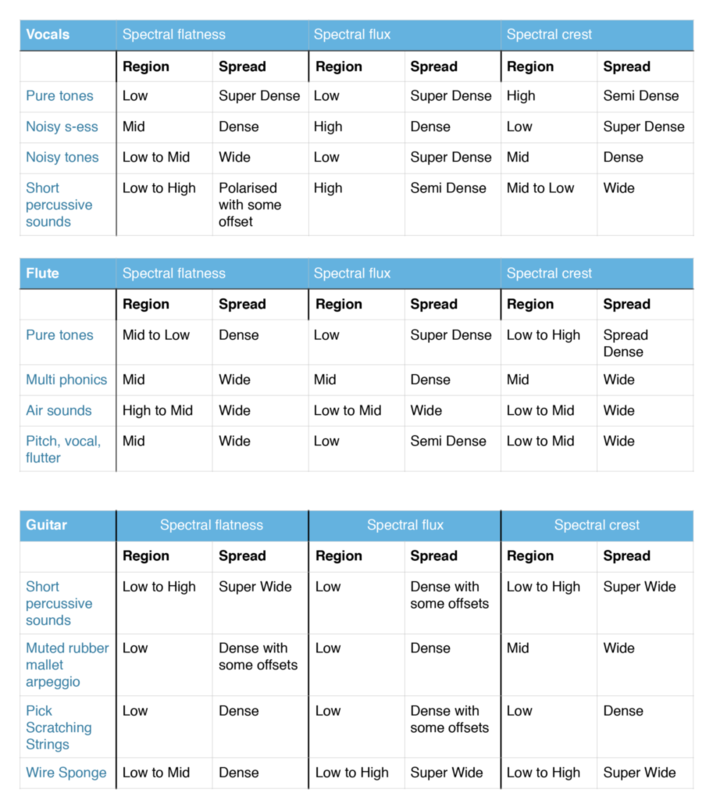 The mapping and processing options for event-based signals like MIDI would have even more degrees of freedom than what we achieve with the Analyzer-Modulator approach, and it would have an even greater degree of “remoteness” or “disconnectedness”. For Ligeti, one of the interesting things is the diconnectedness and how it affects our playing. In perspective, we start to see some different viewing angles on how crossadaptivity can be implemented and how it can influence communication and performance. In this meeting we also discussed problems of the current tools, mostly concerned with the tools of the Analyzer-Moduator method, as that is where we have experienced the most obvious technical hindrance for effecttive exploration. One particular problem is the use of MIDI controller data as our output. Even though it gives great freedom in modulator destinations, it is not straightforward for a system operator to keep track of which controller numbers are actively used and what destinations they correspond to. Initial investigations of using OSC in the final interfacing to the DAW have been done by Brandtsegg, and the current status of many DAWs seems to allow “auto-learning” of OSC addresses based on touching controls of the modulator destination within the DAW. a two-way communication between the DAW and ouurr mapping module should be within reach and would immensely simplify that part of our tools. We also discussed the selection of features extracted by the Analyzer, whic ones are more actively used, if any could be removed and/or if any could be refined. Each of the participants was invited to give their initial comments on these issues. Victor suggests we could rationalize the tools a bit, simplify, and get rid of the Python dependency (which has caused some stability and compatibility issues). This should be done without loosing flexibility and usability. Perhaps a turn towards the originally planned direction of reying basically on Csound for analysis instead of external libraries. Bernt has had some meetings with Trond recently and they have some common views. For them it is imperative to be able to use Ableton Live for the audio processing, as the creative work during sessions is really only possible using tools they are familiar with. Finding solutions to aesthetic problems that may arise require quick turnarounds, and for this to be viable, familiar processing tools. There have been some issues related to stability in Live, which have sometimes significantly slowed down or straight out hindered an effective workflow. Trond appreciates the graphical display of signals, as it helps it teaching performers how the analysis responds to different playing techniques. Bernt also mentions the use of very simple scaled-down experiments directly in Max, done quickly with students. It would be relatively easy to make simple patches that combines analysis of one (or a few) features with a small number of modulator parameters. Josh and Marije also mentions modularity and scaling down as measures to clean up the tools. Sigurd has some other perspectives on this, as it also relates to what kind of flexibility we might want and need, how much free experimentation with features, mappings and desintations is needed, and also to consider if we are making the tools for an end user or for the research personell within the project. Oeyvind also mentions some arguments that directly opposes a modular structure, both in terms of the number of separate plugins and separate windows needed, and also in terms of analyzing one signal with relation to activity in another (f.ex. for cross-bleed reduction and/or masking features etc). Josh asks about the stability issues reported. any special feature extractors, or other elements that have been identified that triggers instabilities. Oeyvind/Victor discuss a bit about the Python interface, as this is one issue that frequently come up in relation to compatibility and stability. There are things to try, but perhaps the most promising route is to try to get rid of the Python interface. Josh also asks about the preferred DAW used in the project, as this obviously influence stability. Oeyvind has good experience with Reaper, and this coincides with Josh’s experience at QMUL. In terms of stability and flexibility of routing (multichannel), Reaper is the best choice. Crossadaptive work directly in Ableton Live can be done, but always involve a hack. Other alternatives (Plogue Bidule, Bitwig…) are also discussed briefly. Victor suggests selecting a reference set of tools, which we document well in terms of how to use them in our project. Reaper has not been stable for Bernt and Trond, but this might be related to setting of specific options (running plugins in separate/dedicated processes, and other performance options). In any case, the two DAWs of immediate practical interest is Reaper (in general) and Live (for some performers). An alternative to using a DAW to host the Analyzer might also be to create a standalone application, as a “server”, sending control signals to any host. There are good reasons for keeping it within the DAW, both as session management (saving setups) and also for preprocessing of input signals (filtering, dynamics, routing). Some of the stability issues can be remedied by simplifying the analyzer, getting rid of unused features, and also getting rid of the Python interface. Simplification will also enable use for less trained users, as it enable self-education and ability to just start using it and experiment. Modularity might also enhance such self-education, but a take on “modularity” might simply hiding irrelevant aspects of the GUI. In terms of feature selection the filtering of GUI display (showing only a subset) is valuable. We see also that the number of actively used parameters is generally relatively low, our “polyphonic attention” for following independent modulations generally is limited to 3-4 dimensions. It seems clear that we have some overshoot in terms of flexibility and number of parameters in the current version of our tools. Marije also suggests we should investigate further what happens on repeated use. When the same musicians use the same setup several times over a period of time, working more intensively, just play, see what combinations wear out and what stays interesting. This might guide us in general selection of valuable features. Within a short time span (of one performence), we also touched briefly on the issue of using static mappings as opposed to changing the mapping on the fly. Giving the system operator a more expressive role, might also solve situations where a particular mapping wears our or becomes inhibiting over time. So far we have created very repeatable situations, to investigate in detail how each component works. Using a mapping that varies over time can enable more interesting musical forms, but will also in general make the situation more complex. Remembering how performers in general can respond positively to a certain “richness” of the interface (tolerating and even being inspired by noisy analysis), perhaps varying the mapping over time also can shift the attention more on to the sounding result and playing by ear holistically, than intellectually dissecting how each component contributes. Concluding remarks also suggests that we still need to play more with it, to become more proficient, having more control, explore and getting used to (and getting tired of) how it works. After an inspiring talk with Marije on March 3rd, I set out to write this blog post to sum up what we had been talking about. As it happens (and has happened before), Marije had a lot of pointer to other related works and writings. Only after I had looked at the material she pointed to, and reflected upon it, did I get around to writing this blog post. So substantial parts of it contains more of a reflection after the conversation, rather than an actual report of what was said directly. Marije mentiones we have done a lot of work, it is inspiring, solid, looks good. One of the first subjects in our conversation was how we relate to the instrument. For performers: How does it work? Does it work? (does it do what we say/think it does?) What do I control? What controls me? when successful it might constitute a 3rd agency, a shared feeling, mutual control. Not acting as a single musician, but as an ensemble. The same observation can of course be made (when playing) in acoustic ensembles too, but it is connected differently in our setting. Direct/indirect control. Play music or generate control signals? Very direct and one-dimensional mappings can easily feel like playing to generate control signals. Some control signals can be formed (by analyzing) over longer time spans, as they represent more of a “situation” than an immediate “snapshot”. Perhaps just as interesting for a musician to outline a situation over time, than to simply control one sonic dimension by acting on another? Out-of-time’d-ness, relating to the different perceptions of the performative role experienced in IR recording (see posts on convolution sessions here, here and here). A similar experience can be identified within other forms of live sampling. to some degree recognizable with all sorts of live processing as an instrumental activity. For the live processing performer: a detached-ness of control as opposed to directly playing each event. Contrived and artificial mappings. I asked whether the analyzer-modulation mappings are perhaps too contrived, too “made up”? Marije replying that everything we do with electronic music instrument design (and mapping) is to some degree made up. It is always artibrary, design decisions, something made up. There is not one “real” way, no physical necessity or limitation that determines what the “correct” mapping is. As such, there are only mappings that emphasize different aspects of performance and interaction, new ideas that might seem “contrived” can contain yet-to-be-seen areas of such emphasis. Composition is in these connections. For longer pieces one might want variation in mapping. For example, in the combined instrument created by voice and drums in some of our research sessions. Depending on combination and how it is played, the mapping might wear out over time, so one might want to change it during one musical piece. Limitation. In January I did a presentation at UC Irvine, for an audience well trained in live processing and electronic music performance. One of the perspectives mentioned there was that the cross-adaptive mapping could also be viewed as a limitation. One could claim that all of these modulations that we can perform cross-adaptively could have been manually controlled, an with much more musical freedom if manually controlled. Still, the crossadaptive situation provides another kind of dynamic. The acoustic instrument is immediate and multidimensional, providing a nuanced and intuitive interface. We can tap into that. As an example as to how the interfacne changes the expression, look at how we (Marije) use accelerometers over 3 axes of motion: one could produce the same exact same control signals using 3 separate faders, but the agency of control, the feeling, the expressivity, the dynamic is different with accelerometers that it is with faders. It is different to play, and this will produce different results. The limitations (of an interface or a mapping) can be viewed as something interesting, just as much as something that inhibits. One thing that have concerned me lately is the fact that the analyzer is sometimes too sensitive to minor variations in the signal. Mathematical differences sometimes occur on a different scale than the expressive differences. One example is the rhythm analyzer, the way I think it is too noisy and unreliable, seen in the light of the practical use in session, where the musicians found it very appropriate and controllable. Marije reminds me that in the live performance setting, small accidents and surprises are inspiring. In a production setting perhaps not so much. Musicians are trained to embrace the imperfections of, and characteristic traits of their instument, so it is natural for them to also respond in a similar manner to imperfections in the adaptive and crossadaptive control methods. This makes me reflect if there is a research methodology of accidents(? ), on how to understand the art of the accident, understand the failure of the algorithm, like in glitch, circuit bending, and other art forms relating to distilling and refining “the unwanted”. of musical expressivity. I have some ideas of maintaining several parallel hypotheses on how to interpret input, based on previous rhythm research. some of this comes from “Machine Musicianship” by Robert Rowe, some from readin a UCSD dissertation by Michelle L. Daniels: “An Ensemble Framework for Real-Time Beat Tracking”. I am currently trying to distill these into a simplest possible method of rhythm analysis for our purposes. So I ask Marije on ideas on how to refine the rhythm analyzer. Rhythm can be one parameters that outlines “a situation” just as much as it creates a “snapshot” (recall the discussion of agency and direct/indirect control, above). One thing we may want to extract is slower shifts, from one situation to another. My concerns that it takes too long to analyze a pattern (well, at least as long as the pattern itself, which might be several seconds) can then be regarded less of a concern, since we are not primarily looking for immediate output. Still, I will attempt to minimize the latency of rhythm analysis, so that any delay in response is due to aestethic choice, and not so much limited by the technology. She also mentions the other Nick Collins. I realize that he’s the one behind the bbcut algorithm also found in Csound. I’ve used a lot a long time ago. Collins has written a library for feature extraction within SuperCollider. To some degree there is overlap with feature extraction on our Analyzer plugin. Collins invokes external programs to produce similarity matrices, something that might be useful for our purposes as well, as a means of finding temporal patterns in the input. In terms of rhythm analysis, it is based on beat tracking as is common. While we in our rhythm analysis attempts at *not relying* on beat tracking, we could still perhaps implement it, if nothing else so to use it as a measure of beat tracking confidence (assuming this as a very coarse distinction between beat based and more temporally free music. Another perspective on rhythm analysis can also perhaps be gained from Clarence Barlow’s interest in ratios. The ratio book is available online, as is a lot of his other writings. Barlow states “In the case of ametric music, all pulses are equally probable”… which leads me to think that any sort of statistical analysis, frequency of occurence of observed inter-onset times, will start to give indications of “what this is”… to lift it slowly out of the white-noise mud of equal probabilities. Lekkas describes the traditional manner of writing down all rational numbers by starting with 1/1 (p 38), then increasing the numerator by one, then going through all denominators from 1 up to the nominator, skipping fracions that can be simplified since they represent numbers earlier represented. This ordering does not imply any relation to complexity of the ratios produced. If tried to use it as such, one problem with this ordering is that it determines that subdividing in 3 is less complex than subdividing in 4. Intuitively, I’d say a rhythmic subdivision in 3 is more complex than a further subdivision of the first established subdivision in 2. Now, could we, to try to find a measure of complexity, assume that divisions further apart from any previous established subdivision are simpler than the ones creating closely spaced divisions(?). So, when dividing 1/1 in 2, we get a value at 0.5 (in addition to 0.0 and 1.0, which we omit for brevity). Then, trying to decide what is the next further division is the most complex, we try out all possible further subdivision up to some limit, look at the resulting values and their distances to already excisting values. Dividing in 3 give 0.33 and 0.66 (approx), while dividing in 4 give the (new) values 0.25 and 0.75. Dividing by 5 gives new values at .2 and .4, by 6 is unnecessary as it does not produce any larger distances than already covered by 3. Divide by 7 gives values at .142, 0.285 and .428. Divide by 8 is unnecessary as it does not produce any values of larger distance than the divide by 4. The lowest distance introduced by dividing in 3 is 0.33 to 0.5, a distance of approx 0.17. The lowest distance introduced by dividing in 4 is from 0.25 to 0.5, a distance of 0.25. Dividing into 4 is thus less complex. Checking the divide by 5 and 7 can be left as an exercise to the reader. Then we go on to the next subdivision, as we now have a grid of 1/2 plus 1/4, with values at 0.25, 0.5 and 0.75. The next two alternatives (in increasing numeric order) is division by 3 or division by 5. Division by 3 gives a smallest distance (to our current grid) from 0.25 to 0.33 = 0.08. Division by 5 gives a smallest distance from 0.2 to 0.25 = 0.05. We conclude that division by 3 is less complex. But wait, let’s check division by 8 too while we’re at it also here, leaving divide by 6 and 7 as an exercise to the reader). Division by 8, in relation to our current grid (.25, .5, .75) gives a smallest distance of 0.125. This is larger than the smallest distance produced by division in 3 (0.08), so we choose 8 as our next number in increasing order of complexity. Following up on this method, using a highest subdivision of 8, eventually gives us this order 2,4,8,3,6,5,7 as subdivisions in increasing order of complexity. This coincides with my intuition of rhythmic complexity, and can be reached by the simple procedure outlined above. We could also use the same procedure to determine the exact value of complexity for each of these subdivisions, as a means to create an output “value of complexity” for integer ratios. As a side note to myself, check how this will differ from using Tenney height or Benedetti height as I’ve used earlier in the Analyzer. Much of the book relates to ratios as in pitch ratios and tuning. Even though we can view pitch and rhythm as activity within the same scale, as vibrations/activations at different frequencies, the perception of pitch is further complicated by the anatomy of our inner ear (critical bands), and by cultural aspects and habituation. Assumedly, these additional considerations should not be used to infer complexity of rhythmic activity. We can not directly use harmonicity of pitch as a measure of the harmonicity of rhythm, even though it might *to some extent* hold true (and I have used this measure up until now in the Analyzer). Further writings by Barlow on this subject can also be found in his On Musiquantics. “Can the simplicity of a ratio be expressed quantitatively?” (s 38), related to the indegestability formula. See also how “metric field strength” (p 44), relates to the indispensability formula. The section from p 38-47 concerns this issue, as well as his “Formulæ for Harmonicity” p 24, (part II), with Interval Size, Ratios and Harmonic Intensity on the following pages. For pitch, the critical bandwidth (p 48) is relevant but we could discuss if not the “larger distance created by a subdivision” as I outlined above is more appropriate for rhythmic ratios. The 3Dmin book “Musical Instruments in the 21st Century” explores various notions of what an instrument can be, for example the instrument as a possibility space. Lopes/Hoelzl/de Campo, in their many-fest “favour variety and surprise over logical continuation” and “enjoy the moment we lose control and gain influence”. We can relate this to our recent reflections on how performers in our project thrive in a setting where the analysis meethods are somewhat noisy and chaotic. The essence being they can control the general trend of modulation, but still be surprised and disturbed” by the immediate details. Here we again encounter methods of the “less controllable”: circuit bending, glitch, autopoietic (self-modulating) instruments, meta-control techniques (de Campo), and similarly the XY interface for our own Hadron synthesizer, to mention a few apparent directions. The 3DMIN book also has a chapter by Daphna Naphtali on using live processing as an instrument. She identifies some potential problems about the invisible instrument. One problem, according to Naptali, is that it can be difficult to identify the contribution (of the performer operating it). One could argue that invisibility is not necessarily a problem(? ), but indeed it (invisibility and the intangible) is a characteristic trait of the kind of instruments that we are dealing with, be it for live processing as controlled by an electronnic musician, or for crossadaptive processing as controlled by the acoustic musicians. In light of the complexity of crossadaptive effects, the simpler adaptive effects could be used as a means of familiarization for both performers and “mapping designers” alike. Getting to know how the analyzer reacts to different source material, and how to map the signals in a musically effective manner. The adaptive use case is also more easily adaptable to a mixing situation, for composed music, and any other kind of repeatable situation. The analyzer methods can be calibrated and tuned more easily for each specific source instrument. Perhaps we could also look at a possible methodology for familiarization, how do we most efficiently learn to know these feature-to-modulator mappings. Revising the literature on adaptive audio effects (Verfaille etc) in the light of our current status and reflections might be a good idea. Similarly, it might be a good idea to get on touch with environments and performers using adaptive techniques as part of their setup. Marije reminded me that Jos Zwaanenburg and his students at the Conservatorium of Amsterdam might have more examples of musicians using adaptive control techniques. I met Jos some years ago, and contacted him again via email now. Hans Leeouw is another Dutch performer working with adaptive control techniques. His 2009 NIME article mentions no adaptive control, but has a beautiful statement on the design of mappings: “…when the connection between controller and sound is too obvious the experience of ‘hearing what you see’ easily becomes ‘cheesy’ and ‘shallow’. One of the beauties of acoustic music is hearing and seeing the mastery of a skilled instrumentalist in controlling an instrument that has inherent chaotic behaviour “. In the 2012 NIME article he mentions audio analyses for control. I Contacted Hans to get more details and updated information about what he is using. Via email he tells that he use noise/sinusoidal balance as a control both for signal routing (trumpet sound routed to different filters), and also to reconfigure the mapping of his controllers (as appropriate for the different filter configuration). He mentions that the analyzed transition from noise to sinusoidal can be sharp, and that additional filtering is needed to geet a smooth transition. A particularly interesting area occurs when the routing and mapping is in this intermediate area, where both modes of processing and mapping are partly in effect. As an example of on researcher/performer that has explored voice control, Marije mentioned Dan Stowell. Nor surprisingly, he’s also done his research in the context of QMUL. Browsing his thesis, I note some useful terms for ranking extracted features, as he writes about *perceptual relevance*, *robustness*, and *independence*. His experiments on ranking the different features are not conclusive, as “none of the experiments in themselves will suggest a specific compact feature set”. This indication coincides with our own experience so far as well, that different instruments and different applications require different subsets of features. He does however mention spectral centroid, to be particularly useful. We have initially not used this so much due to a high degree of temporal fluctuation. Similarly, he mentions spectral spread, where we have so far used more spectral flatness and spectral flux. This also reminds me of recent discussions on the Csound list regarding different implementations of the analysis of spectral flux (difference from frame to frame or normalized inverse correlation), it might be a good idea to test the different implementations to see if we can have several variations on this measure, since we have found it useful in some but not all of our application areas. Stowell also mentions log attack time, which we should revisit and see how we can apply or reformulate to fit our use cases. A measure that we haven’t considered so far is delta MFCCs, the temporal variation within each cepstral band. Intuitively it seems to me this couldd be an alternative to spectral flux, even though Stowell have found it not to have a significant mutual information bit (delta MFCC to spectral flux). In fact the Delta MFCCs have little MI with any other features whatsoever, although this could be related to implementation detail (decorrelation). He also finds that Delta MFCC have low robustness, but we should try implementing it and see what it give us. Finally, he also mentions *clarity* as a spectral measure, in connectino to pitch analysis, defined as “the normalised strength of the second peak of the autocorrelation trace [McLeod and Wyvill, 2005]”. It is deemed a quite robust measure, and we could most probably implement this with ease and test it. Online conversation with Gary Bromham (London), Bernt Isak Wærstad (Oslo), Øyvind Brandtsegg (San Diego), Trond Engum and Andreas Bergsland (Trondheim). Gyrid N. Kaldestad, Oslo, was also invited but unable to participate. The meeting revolves around the issues “mixing and timbral character” as related to the crossadaptive project. As there are many aspects of the project that touches upon these issues, we have kept the agenda quite open as of yet, but asking each participant to bring one problem/question/issue. 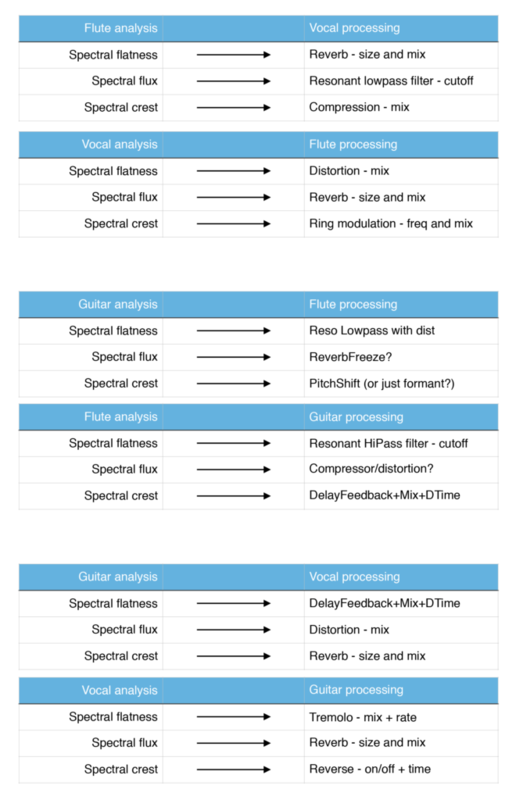 In Oslo they worked with the analysis parameters spectral crest and flux, aiming to use these to create a spectral “ducking” effect, where the actions of one instrument could selectively affect separate frequency bands of the other instrument. Gary is also interested in these kinds of techniques for mixing, to work with masking (allowing and/or avoiding masking). One could think if it as a multiband sidechaining with dynamic bands, like a de-esser, but adaptive to whichever frequency band currently needs modification. These techniques are related both to previous work on adaptive mixing (for example at QMUL) and also partially solved by recent commecial plugins, like Izotope Neutron. However interesting these techniques are, the main focus of our current project is more on the performative application of adaptive and crossadaptive effects. That said, it could be fruitful using these techniques, not to solve old problems, but to find new working methods in the studio as well. In the scope of the project, this kind of creative studio work can be aimed at familiarizing ourselves with the crossadaptive methods in a controlled and repeatable setting. Bernt also brought up the issue of recording the analysis signals, using them perhaps as source material for creative automation, editing the recorded automation as one might see fit. This could be an effective way of familiarization with the analyzer output as well, as it invites taking a closer look at the details of the output of the different analysis methods. Recording the automation data is straightforward in any DAW, since the analyzer output comes into the DAW as external MIDI or OSC data. The project does not need to develop any custom tools to allow recording and editing of these signals, but it might be a very useful path of exploration in terms of working methods. I’d say yes please, go for it. Trond had recently done a crossadaptive session with classical musicians, playing composed material. It seems that this, even though done “live” has much in common with applying crossadaptive techniques in post production or in mixing. This is because the interactive element is much less apparent. The composition is a set piece, so any changes to the instrumental timbre will not change what is played, but rather can influence the nuances of interpretation. Thus, it is much more a one-way process instead of a dialectic between material and performance. Experts on interpretation of composed music will perhaps cringe at this description, saying there is indeed a dialogue between interpretation and composition. While this is true, the degree to which the performed events can be changed is lesser within a set composition. In recent sessions, Trond felt that the adaptive effects would exist in a paralell world, outside of the composition’s aesthetic, something unrelated added on top. The same can be said about using adaptive and crossadaptive techniques in a mixing stage of a production, where all tracks are previously recorded and thus in a sense can be regarded as a set (non-changeable) source. With regards to applying analysis and modulation to recorded material, one could also mention that the Oslo sessions used recordings of the (instruments in the session) to explore the analysis dimensions. This was done as an initial exploratory phase of the session. The aim was finding features that already exist in the performer’s output, rather than imposing new dimensions of expression that the performer will need to adapt to. The analysis-modulator response to an acoustic input is not always explicitly controllable. This is due to the nature of some of the analysis methods, technical weaknesses that introduce “flicker” or noise in the analyzer output. Even though these deviations are not inherently random, they are complex and sometimes chaotic. In spite of these technical weaknesses, we notice that our performers often will thrive. Musicians will often “go with the flow” and create on the spot, the interplay being energized by small surprises and tensions, both in the material and in the interactions. This will sometimes allow the use of analysis dimensions/methods that have spurious noise/flicker, still resulting in a consistent and coherent musical output, due to the performer’s experience in responding to a rich environment of sometimes contradicting signals. This touches one of the core aspects of our project, intervention into the traditional modes of interplay and musical communication. It also touches upon the transparency of the technology, how much should the performer be aware of the details of the signal chain? Sometimes rationalization makes us play safe. A fruitful scenario would be aiming for analysis-modulator mappings that create tension, something that intentionally disturbs and refreshes. The current status of our research leaves us with a seemingly unlimited amount of combinations and mappings, a rich field of possibilities, yet to be charted. The options are still so many that any attempt at conclusions about how it works or how to use it seems futile. Exploration in many directions is needed. This is not aimless exploration, but rather searching without knowing what can be found. Andreas mentions is is hard to pinpoint single issues in this rich field. As observer it can be hard to decode what is happening in the live setting. During sessions, it is sometimes a complex task following the exact details of the analysis and modulation. Then, when listening to the recorded tracks again later, it is easier to appreciate the musicality of the output. Perhaps not all details of the signal chain are cleanly defined and stringent in all aspects, but the resulting human interaction creates a lively musical output. As with other kinds of music making, it is easy to get caught up in detail at time of creation. Trying to listen more in a holistic manner, taking in the combined result, is a skill not to be forgotten also in our explorations. One way of working towards a better understanding of the signal interactions involved in our analyzer-modulator system is to do adaptive modulation rather than cross-adaptive. This brings a much more immediate mode of control to the performer, exploring how the extracted features can be utilized to change his or her own sound. It seems several of us have been eager to explore these techniques, but putting it off since it did not align with the primary stated goals of crossadaptivity and interaction. Now, looking at the complexity of the full crossadaptive situation, it is fair to say that exploration of adaptive techniques can serve as a very valid manner of getting in touch with the musical potential of feature-based modulation of any signal. In it’s own right, it can also be a powerful method of sonic control for a single performer, as an alternative to a large array of physical controllers (pedals, faders, switches). As mentioned earlier in this session, working with composed material or set mixes can be a challenge to the crossadaptive methods. Exploring adaptive techniques might be more fruitful in those settings. Working with adaptive effects also brings the attention to other possibilities of control for a single musician over his or her own sound. Some of the recent explorations of convolution with Jordan Morton shows the use of voice controlled crossadaptivity as applied to a musician’s own sound. In this case, the dual instrument of voice and bass operated by a single performer allows similar interactions between instruments, but bypassing the interaction between different people, thus simplifying the equation somewhat. This also brings our attention to using voice as a modulator for effects for instrumentalists not using voice as part of their primary musical output. Although this has been explored by several others (e.g. Jordi Janner, Stefano Fasciani, and also the recent Madrona Labs “Virta” synth) it is a valid and interesting aspect, integral to our project.